Christopher Columbus landed on Guadeloupe on November 4, 1493. Though originally called Karukéra (Island of Beautiful Waters) by the Carib Indians, Columbus named the island after the famous sanctuary of Santa Maria de Guadalupe de Estremadura. Lacking gold and silver, the island was not of great interest to the Europeans until the17th century. For a brief period the Spanish had tried to settle Guadeloupe but were stopped by the ferocious Carib Indians. Then around 1635, the French began to colonize the island. With the institutionalization of slavery in 1644, the trade of spices, sugar, tobacco and rum prospered between France, Africa and the Antilles. 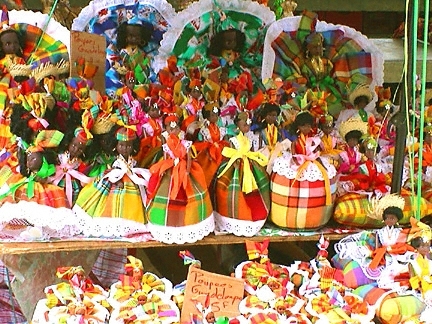 Guadeloupe was officially annexed by the King of France in 1674. As the island prospered, it became the scene of great battles between the French and the British, who occupied it from 1759 to 1763. That year it was restored to France in exchange for all French rights to Canada. But the tug-of-war continued on and off until 1815, when the Treaty of Paris designated Guadeloupe as French. In 1848, thanks to the efforts of Victor Schoelcher, slavery was abolished. Guadeloupe was represented for the first time in the French Parliament in 1871. It became a French Départment on March 19, 1946.